Your Plumbing Company in Chesapeake, VA! 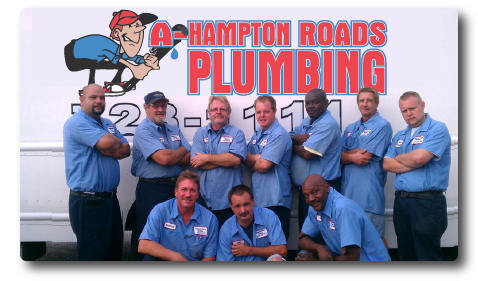 A Hampton Roads Plumbing is your trusted local plumber in Chesapeake, VA for over 20 years. Count on our on-call plumbing experts to fix any plumbing problems in your home or business. No job is too big or too small! Call us here in Chesapeake, VA for fast, affordable and reliable service. Plumbing emergency in the Chesapeake, VA area? We are on call 24/7 with trained plumbing experts! If you have a sudden pipe burst, water leak, overflow or any sink, tub or toilet leak, we can be on-scene to fix your plumbing leaks quickly. Give us a call for a low price to unclog your drain or sewer problems. Do you have a blocked or slow running main sewer, sink, toilet, tub or any other drain stoppage in your Chesapeake area home? We’re on call for you! We also have specialized equipment such as High Pressure Water Jets, and industrial rotor machines for heavy and thick root problems. Leaking dish washer? Trust the experienced team at A Hampton Roads Plumbing to quickly identify and fix your dish washer problem here in the Hampton Roads area. Clogs and drain problems can cause problems all throughout your home, so it’s necessary that a trained plumber discover the problem at its root. We can fix or replace your hot water heater problems in Chesapeake faster and more affordable than other plumbing companies. Call the experts at A Hampton Roads Plumbing for a fast response. It may require a repair or a brand new water heater. Either way, our experienced plumbing tech’s can quickly identify the problem and recommend the best option for you at a cost that won’t break the bank. We also offer sewer line repair and replacement. Call on the trained experts at A Hampton Roads Plumbing to make sure your sewer pipes are operating smoothly, safely and efficiently.